Okay … beat me, whip me, make me write bad checks! It’s been so long since my last recipe here that I’m sure entire species have had the opportunity to evolve. I promise to have more coming in the near future. No … REALLY! 😉 For now, I’m back just in time to share my famous gravy recipe – a must for any Turkey-Day table. Best thing is that you can make this base ahead of time and then just reheat and add some turkey drippings on the big day. In large saucepan, heat oil and garlic slices. Then, add turkey neck, giblets, salt, and pepper. Brown neck and giblets. 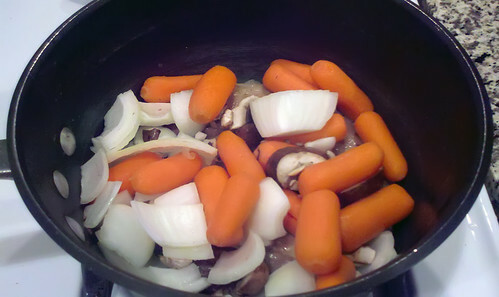 When you flip them to brown the other side, add carrots, celery, onion, and mushrooms. When neck and giblets are fully browned, and onions begin to get translucent, add stock. Bring to a gentle boil, then simmer for 90 minutes covered. When done, strain broth into suitable container and set aside. Also reserve 1/3 of each type of veggie. Remove neck and shred as much meat as possible off of it with two forks. Chop up liver into small pieces. 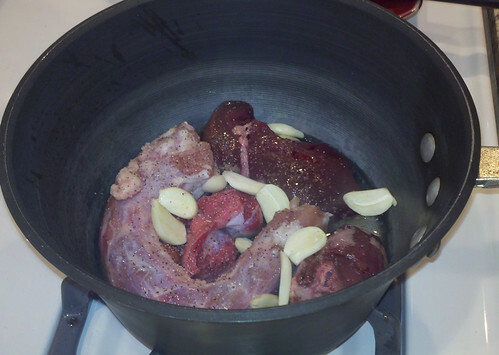 Discard gizzard, heart, and remainder of neck. 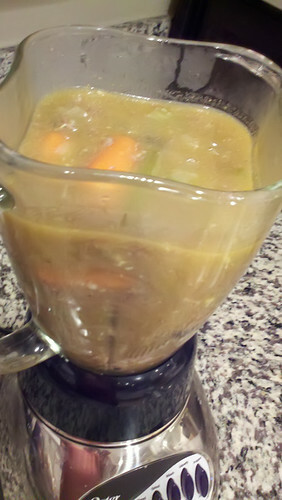 Place reserved veggies, neck and liver meat, and reserved broth into blender or processor on “high” until ingredients are completely liquified. This is your gravy base. 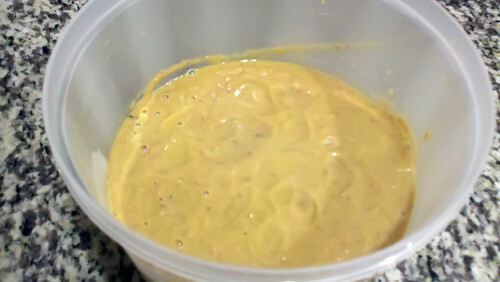 It should have the color of dull mustard and should have the consistency of a milkshake. Place into an airtight container and refrigerate until needed. 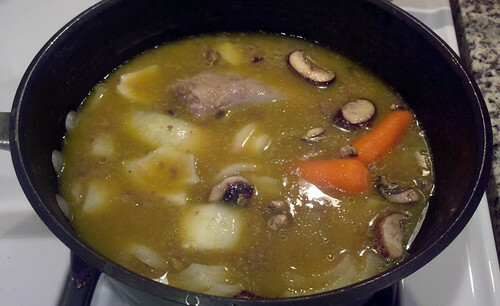 When you are ready to make your gravy, remove the base from the fridge about 20 minutes prior. Return to large saucepan, cover and heat over a low flame. 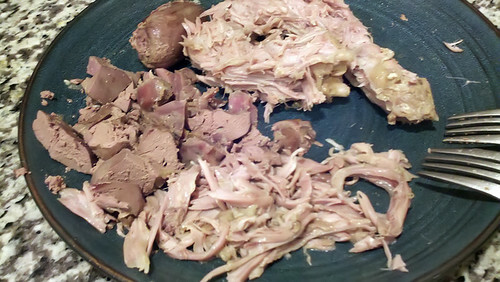 Take drippings from turkey roasting pan (after having skimmed off the fat) and stir into base. BOOM … you have gravy! Pour liberally over turkey, stuffing, mashed potatoes, and anything else you desire (careful, though … it’s hot 😉 ). Most importantly, have a great Holiday with friends and family, being sure to give thanks for moments like these. ©2013 Caution: Caveman Cooking/UHearMe, Inc. All rights reserved. This recipe originally appeared on the Caution: Caveman Cooking blog at http://cavemancooking.net authored by Caveman. This recipe may be shared and reprinted as long as this entire copyright message accompanies it. 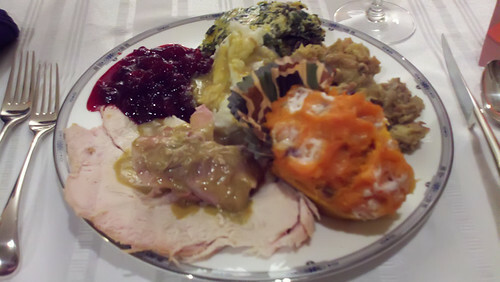 This entry was posted on November 24, 2013 at 4:08 PM	and is filed under Christmas, Holidays, Rubs, Sauces, Marinades & Dressings, Thanksgiving. Tagged: caveman, cooking, dinner, food, garlic, gravy, gravy recipe, olive oil, onion, recipe, sauce, thanksgiving, turkey, Turkey Neck, Vegetable Broth. You can follow any responses to this entry through the RSS 2.0 feed. You can leave a response, or trackback from your own site.